Our selection of air compressors has been meeting the demands of high volume automotive shops, dealerships and smaller shops for years. Here you’ll find gas and electric versions, single and 2 stage versions, plus a wide-selection of reciprocating auto air compressors to power tools in your shop. Choose the compressor for your needs based on whether you need it to work in a typical shop close to an electrical outlet or off-site where a gas-powered unit is preferred. Also think about the right size by figuring out air requirements of the tools it will be powering. Click here for more helpful advice. While single stage units are less expensive, two stage units are a better choice for commercial auto shops in several ways. First, they operate at lower RPMs allowing commercial air compressor to put out more CFM than a comparable-sized single stage compressor. Running at lower RPM's also lets the unit create less heat, which means less moisture will build-up in the tank. Another big benefit is they produce less noise, which is great for indoor environments. 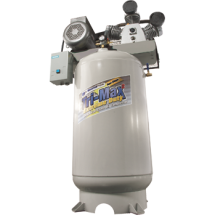 Plus, we offer gas diven models for a mobile environment and service trucks, as well as rotary screw models, for when you want a super quiet commercial air compressor that can run non-stop, 24 hours a day. 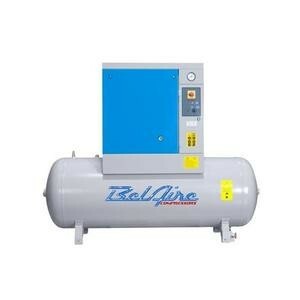 Need advice on which compressor would work best for your garage? Give us a call, or check out the links below. 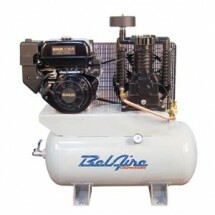 What size and type air compressor do I need?